Hi, my darlings! I have a bit of a double whammy to show you, at least in my eyes! I'm talking about a brand-new collection from Daphine Polish and...my subsequent, frantic desire to read the novels that inspired it--His Dark Materials collection! I'm an avid reader of sci-fi and fantasy novels so I'm quite perplexed how this series escaped my voracious need for reading materials...ah well! Something to look forward to! Now since I don't know much about these books, along with swatches and my own review of each polish, I'm also including the description and the inspiration for each polish as provided to me but Joanne herself. Read on and together, let's discover not only 8 new pretties but what is sure to be a great series! The His Dark Materials trilogy by Philip Pullman includes the books The Golden Compass (published as Northern Lights in the UK), The Subtle Knife, and The Amber Spyglass. At the young age of ten, I first picked up The Golden Compass at summer camp (yes, I was the kid who read at summer camp!) on the advice of a boy I liked. This book, and its sequels, were my first foray into the world of fantasy. I credit them for laying the foundation of a love of science fiction and fantasy that is still strong today. To quickly summarize these books, they tell the coming-of-age adventures of Lyra Belacqua, an ordinary orphan from Oxford who turns out to be the most important person in not just her universe, but in all universes. This collection mainly draws on The Golden Compass and The Subtle Knife for inspiration. Dust : A light yellow-gold shimmer with a touch of scattered holographic effect. Dust is a metaphysical particle invisible to the human eye. Many of the adult characters in His Dark Materials have spent their lives researching and chasing Dust, trying to learn more about this mysterious particle, whether it be to harness its power or destroy it. I was REALLY surprised by how much I liked this polish--yellow is NOT my color but this shade of yellow is so flattering! A perfect, shimmery, sunny yellow that's sure to please even the most hardened anti-yellow girls! Sky Armor : A sky blue shimmering base with blue micro-flakies is inspired by Iorek Byrnison, the armored bear. First encountered in Trollesund, Lyra helps him recover his armor, which was taken from him by the people of the town. Iorek pledges himself to Lyra’s cause and becomes her champion. Lyra’s wits help Iorek defeat the usurper king Iofur Raknison and become king of the bears. Again, this polish was a surprise! Usually pale colors wash me out but this blue was just pigmented enough to work with my complexion and that shimmer really pops in certain lights! Cittàgazze : Loosely translated from Italian, Cittàgazze means “City of the Magpies.” This glitter topper in a clear base is inspired by the city of Cittàgazze in The Subtle Knife and the colors of the Italian Mediterranean. With more than 15 different colors, it sparkles enough to attract any glitter-loving magpie! This swatch shows just two thin coats over Sky Armor above, topped with 1 thicker coat of G&G's HK Girl. Doesn't this glitter mix just make my nails look jewel-encrusted? I'm dying to see how this would look over a jet-black! Gyptian Longboat : A dusty purple with gold and green micro-flakie shimmer, like sun and moss glistening in murky waters. It is inspired by Ma Costa, the leader of a gyptian family, who was Lyra’s nurse as an infant. She and other gypitans have been secretly watching out for Lyra on behalf of the king of the gyptians, John Faa. The gyptians are a nomadic people, living in longboats. They call the Fens of East Anglia home, but travel around Brytain through canals and rivers, making their livelihoods through trade. This is one of my favorites in this collection--the contrast of the green with the purple is just so striking and so much more noticeable in real-life than what my camera picked up! Just gorgeous! Cloud Pine : A taupe light brown shimmer with blue, green, and purple iridescent glitters. Inspired by Serafina Pekkala, the queen of the witch clan, cloud pine is a type of magical tree used by witches to fly. Once the lover of gyptian Farder Coram, Serafina Pekkala allies her clan with the gyptians on their mission to rescue the children from Bolvangar. She rescues Lyra and Roger from the fight at Bolvangar and carries them to safety in Lee Scoresby’s balloon. 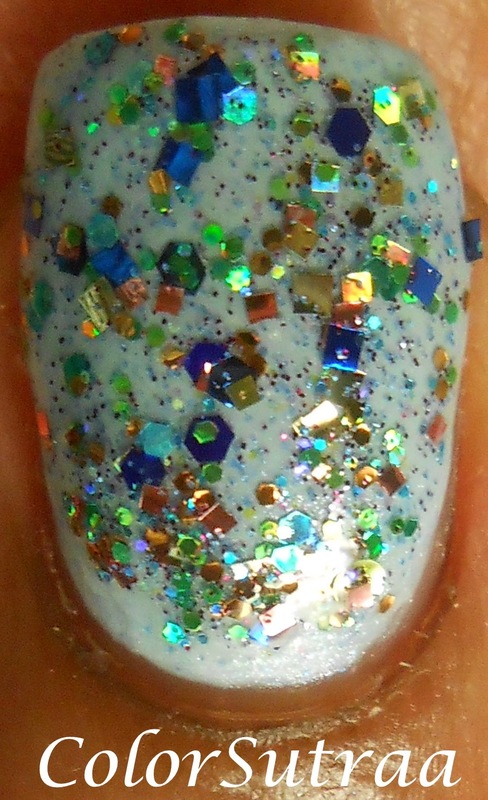 Again, a really striking combination--the iridescent glitters almost make this polish seem like it glows from within! Very unusual, very cool! 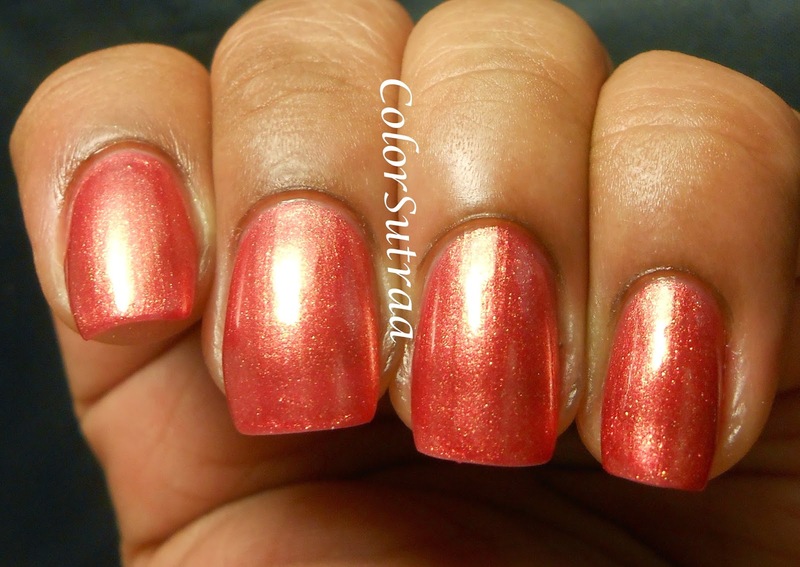 Texas Aeronaut : A red-leaning orange with strong gold micro-flakie shimmer, inspired by Lee Scoresby. A New Dane from the country of Texas, Lee Scoresby is an aeronaut hired by the gyptians in Trollesund on their expedition to the North to rescue the children kidnapped by the Gobblers. He becomes fiercely loyal to Lyra, continuing in her cause even after they are separated on Svalbard. This polish wore more of a coral on me than either red or orange and I absolutely love it! The gold shimmer is absolutely to die for! Knife Bearer : A blackened olive green jelly with strong red shimmer and a touch of scattered holographic effect inspired by Will Parry. He is first introduced in the second book of the trilogy, The Subtle Knife, a quiet and serious twelve year old boy who has learned over the years how to make himself unnoticeable in order to take care of his mentally ill mother. He discovers a window into another world, Cittàgazze’s world, and there meets Lyra and becomes the bearer of the subtle knife. At first glance, I couldn't for the life of me figure out WHAT color this polish was! Was it black? Was it dark brown? Was it maroon? This polish is a true chameleon--you just don't know until you put it on your nails and see for yourself. The dark olive shines through in some lights while in others the strong red shimmer gives it an almost burgundy-maroon appearance. So mysterious! 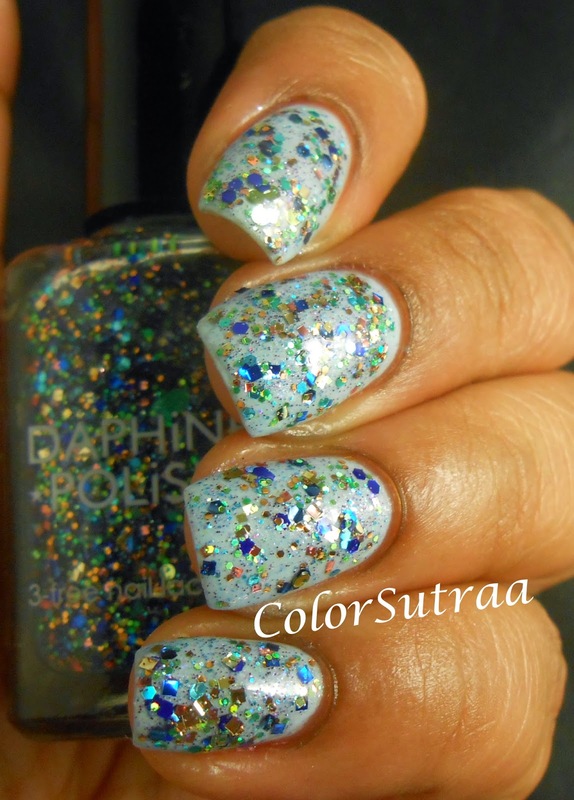 Silvertongue : This silver-blue polish with scattered holo is inspired by Lyra Belacqua, called Lyra Silvertongue by Iorek Byrnison. As The Golden Compass opens we meet Lyra, a somewhat uncouth girl raised at Jordan College in Oxford by scholars and servants, allowed to run wild in the streets and on the rooftops. She is brave and full of fight, willing to go off into the wild North to save her friend Roger from the Gobblers. I'll be the first to admit--silver polish and I are not friends. It's another shade..or rather, non-shade that I feel, in many of its avatars, clashes with my skin tone. Silver has to be just that right shade for it to look good on me and this is oh-so-right! While the finish of this polish is a metallic, it's not streaky or patchy and I believe this shade of silver would be flattering on most complexions! Just beautiful! So there you have it! 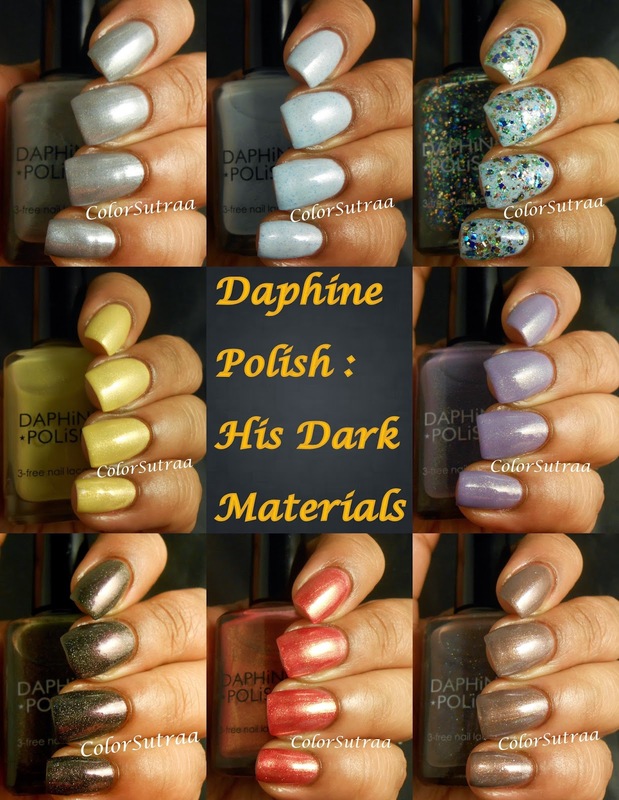 Daphine Polish's brand-new His Dark Materials collection for Summer 2014! You can find these pretties at Daphine Polish's Etsy shop HERE, for the price of $10 for a full-size, 0.5 oz bottle. 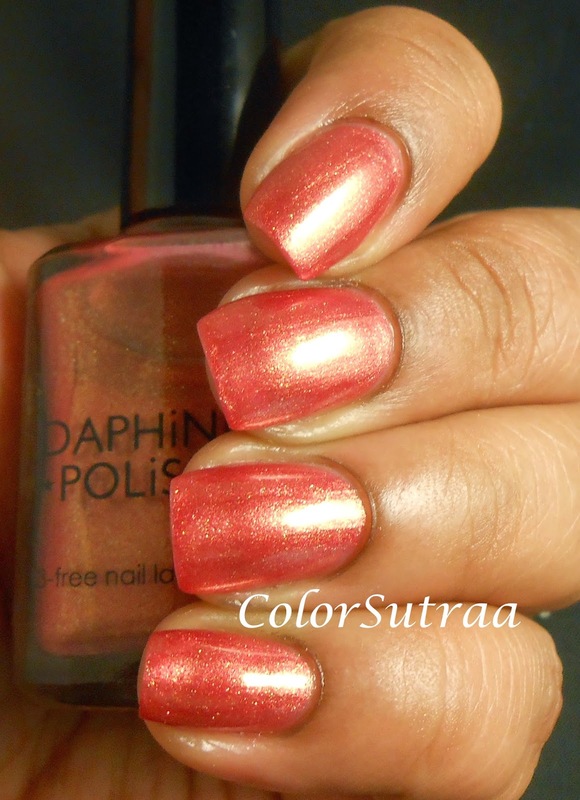 Remember to follow Daphine Polish on FACEBOOK and on INSTAGRAM for all the latest updates and sneak peeks! Tell me which one is YOUR favorite in the comments section below! I would love to hear from you!